Coming off the disappointing 115-98 loss to the L.A. Clippers Monday, the Dallas Mavericks were desperate to find a spark in its match-up with the Utah Jazz before the start of the all-star break. Fortunately for the 19,947 fans in attendance at the American Airlines Center it came from three players as the Mavs were able to pull off the 87-82 victory and head into the midway point of the 2014-15 season with a 36-19 record. In addition to the recent injuries the Mavs are still without starting point guard Rajon Rondo, as he recovers from a facial fracture. His absence has left a big hole in the line-up at the lead guard position and the trio of J.J Barea, Devin Harris and Raymond Felton were given the task of holding the fort while he recovers. 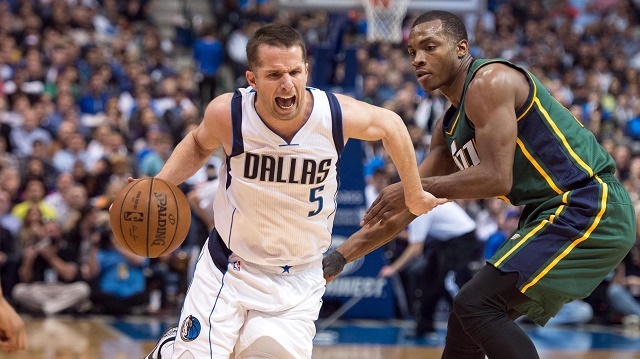 Unfortunately for the Mavs only one of the three, Barea, has stepped up and to his credit has done a great job in Rondo’s absence. In the last five games, the eight year vet from Northeastern, is averaging 13.8 ppg and 5.4 apg and has almost doubled his offensive output since being inserted in the starting line up. Against the Jazz he took advantage of Trey Burke’s inability to defend the pick-and-roll effectively on his way to scoring 22 points on 8-of-15 shooting. Moving forward Coach Carlisle may have to find a way of using Barea more once Rondo does return because this recent stretch has shown his value as a key bench contributor. As far as Felton and Harris the seven day break gives the duo an opportunity to rediscover their role as both have struggled recently — they shot poorly against the Clippers and Felton only saw two minutes of action against the Jazz on Wednesday. But the struggles haven’t been limited to just the point guard position. Since the trade of Branden Wright, the Mavericks have been desperately searching for someone who could give them anything at the back up power forward & center position — whether it was inserting Greg Smith into the rotation or extending the minutes of Dwight Powell. Unfortunately neither seemed prepared for the extended role so the Mavericks signed former center Bernard “Sarge” James to a 10 day contract. Despite only having the morning shoot-around to prepare, the 6’11 center fit right in with the Mavs game plan as he contributed nine points, three rebounds and three blocks in 22 minutes. After a successful stint over in China, “Sarge” seems more equipped now to become the player they hoped he would be when they acquired him in 2012. The re-acquisition of James got the stamp of approval from star Dirk Nowitzki in the post game interviews and the now 13 time all-star (he was named an injury replacement yesterday) has someone he has confidence playing alongside him if Tyson Chandler is out longer than expected. With the second half of the season on the horizon, the emergence of these three key components should have the Mavs trending upward and prepared to overtake the likes of Houston and Portland once the team gets back to full strength.